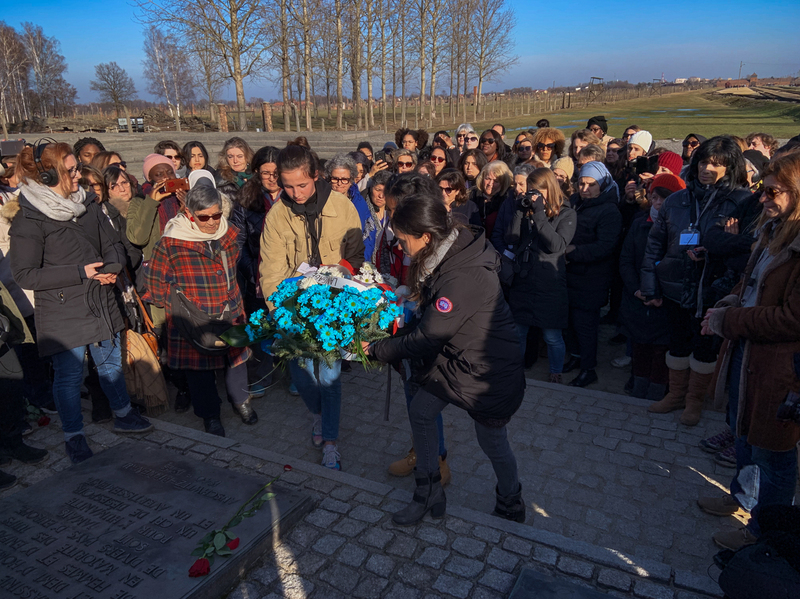 To Counter Anti-Semitism, French Women Find Strength In Diversity At Auschwitz With recent incidents of anti-Semitic vandalism in France, a group of women from different religious and ethnic backgrounds sought greater understanding by learning about the horrors of the Holocaust. In this Feb. 20 photograph, a Nazi sign and words mocking the Holocaust were painted on a tombstone at the Garden of Remembrance in the cemetery in Champagne-au-Mont-d'Or, near Lyon, France. 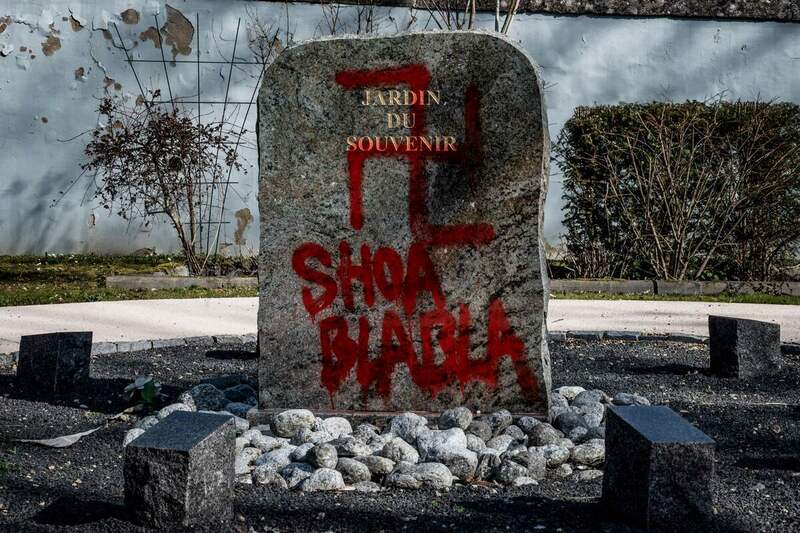 France has been shocked by incidents of anti-Semitic vandalism in the last couple weeks, including 80 tombstones in a Jewish cemetery painted with graffiti and swastikas earlier this month. French President Emmanuel Macron has said France and other Western democracies are experiencing a "resurgence of anti-Semitism unseen since World War II." 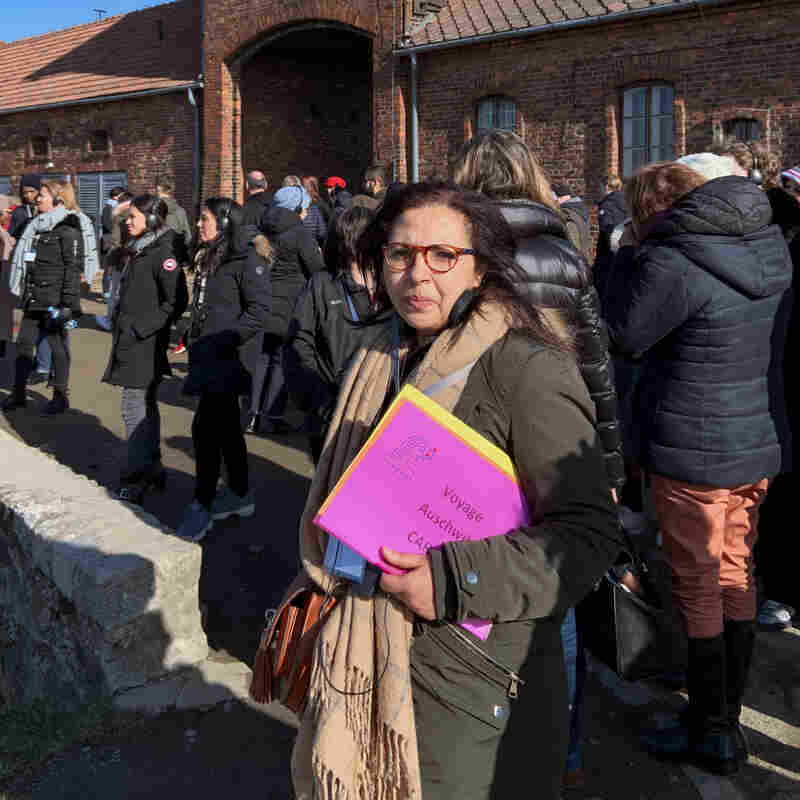 One effort to counter the hate brought about 150 French women together from different religious, ethnic and economic backgrounds to go to a notorious symbol of terror and genocide from that war: Auschwitz. Together they wanted to learn more about the Holocaust, in the hopes of bringing a message of greater understanding back to France. "Women can transmit and educate — to their children, to the rest of society," said Samia Essabbaa, a high school teacher who is president of the diverse group Langage de Femmes, or Women's Voices. The group started their tour at the Judenrampe, or the Jewish platform, where nearly a million men, women and children from around Europe disembarked from trains to go straight to the gas chambers. Members of a group of French women from diverse religious and ethnic backgrounds lay a wreath near the Auschwitz gas chambers earlier this month. After learning more about the horrors of the Holocaust, they hoped to bring greater understanding to their country riven by new acts of anti-Semitism. A 94-year-old Holocaust survivor named Ginette Kolinka described what it was like. Kolinka was deported to Auschwitz from France in April 1944, at age 19. "After we got down from the rail cars and had assembled on the platform, we were told to go to the left or the right," she said. "This was the selection — whether we were to live or die. But we didn't know it at the time." The Judenrampe was the last place she saw her father and younger brother. 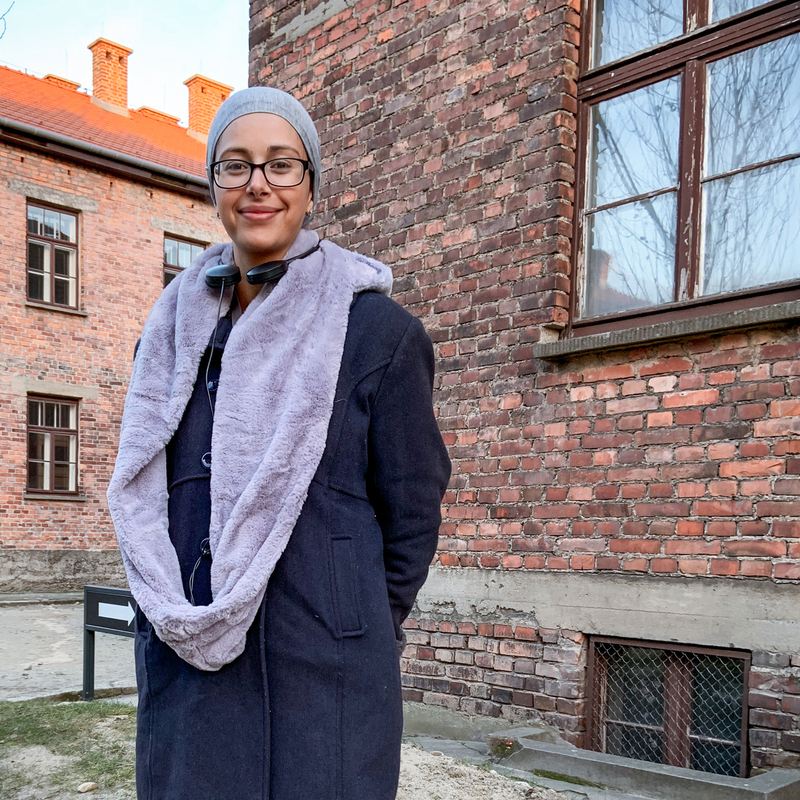 Samia Essabaa is president and co-founder of the group Langage de Femmes, or Women's Voices, which recently visited Auschwitz. "The Nazis lied to us, and they lied to us with such aplomb that we believed them," she said. "They said, 'don't worry, you will all meet up in the camp.' When we got to the camp and saw the chimneys and the smoke and were hit by the terrible odor. And we quickly found out from the other prisoners the terrible secret. But we could have never imagined such a thing." Between 1940 and 1945, researchers estimate at least 1.3 million people were deported to Auschwitz, a complex of forced labor facilities and death camps in Nazi-occupied Poland. More than 1 million of them were killed. Most victims were Jewish, but there were also Roma and other groups. Langage de Femmes is one of the latest interfaith groups to visit the Nazi site at a time when Europe has experienced bouts of vandalism, harassment and attacks against minority groups. Jewish groups and researchers in France say a new anti-Semitism has risen, largely within the country's Muslim communities. Several Jewish cemeteries and memorials in France have been hit with anti-Semitic vandalism in recent months. Earlier in February, two illustrations of a prominent Holocaust survivor were graffitied with swastikas in Paris. The images were of Simone Veil, who was deported to Auschwitz at age 16 and later went on to became one of France's most beloved politicians and public figures. The group visiting Auschwitz peppered their tour guide with questions about Veil. 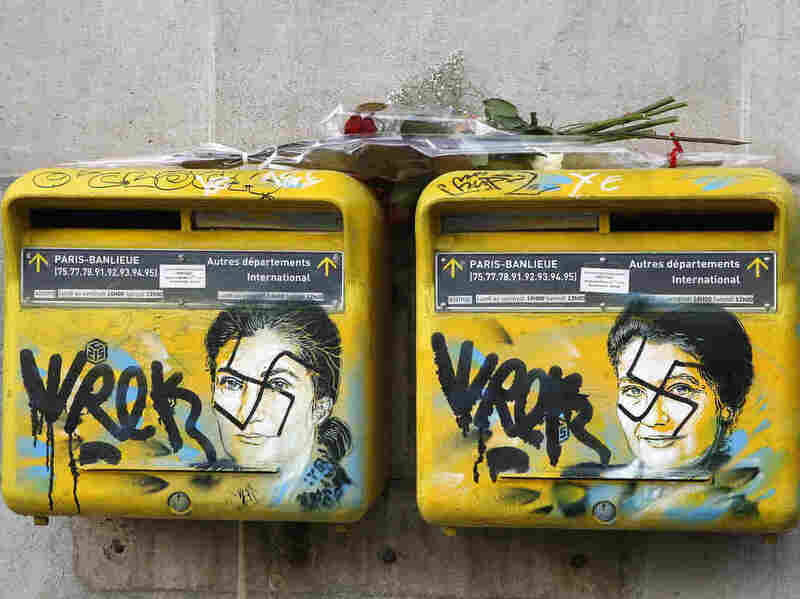 A rose is placed on mailboxes that were vandalized with swastikas covering the face of the late Holocaust survivor and renowned French politician, Simone Veil, in Paris on Feb. 12. According to French authorities, the number of registered anti-Semitic acts rose to 541 in 2018 from 311 in 2017. Other minority groups are also targeted in Europe. Researchers tracking discrimination, harassment and hate crimes against Muslims have warned of a rise of Islamophobia in recent years. Essabbaa, who is Muslim, explained how meaningful it was to visit Auschwitz with women from different backgrounds seeking to stop the hate. "To bring a group of women this diverse here is very important because when we are all here, there is no social level, no one with a job more important than another, and no cultural or religious differences," she said. "We are all part of one community of women whose common goal is to struggle against racism and anti-Semitism." Awa Mangara (right), who grew up in Mali, came to Auschwitz with her 18-year-old daughter Ina, who was born in France. Both were speechless after hearing stories from a Holocaust survivor there. Some of the women, like Awa Mangara, said they were learning about the Holocaust for the first time. Mangara grew up in Mali and came on the trip with her 18-year-old daughter Ina, who was born in France. Both women were silent after Kolinka's testimony. "It must have been so horrible to live through that," Mangara said. "We are in solidarity with her." Another woman on the Auschwitz trip was Laetitia Avia, a congresswoman from President Macron's party. She said as a black woman from a housing project in a Parisian suburb, she has dealt with discrimination her whole life. Avia said her efforts to stop anti-Semitism have earned her the moniker "Negress of the Jews." But that doesn't dissuade her. The 34-year-old recently introduced legislation in French parliament that would slap social media platforms like Twitter with millions of euros in fines if they don't remove hate speech within 24 hours. "[Auschwitz] shows where words and acts of hatred can lead," Avia said. Ibtihele Ben Amor, a teacher at a high school in a Paris suburb, says many of the students grow up hearing stereotypes about Jews at a young age. Ibtihele Ben Amor is a high school teacher in the Paris suburb of Noisy-le-Sec. She is Muslim and wears a headscarf, which she takes off when she teaches. France's secular law prohibits wearing noticeable religious symbols or clothing in public schools and institutions. Ben Amor thinks it would be wonderful to bring her students to Auschwitz. She said some of them grow up hearing stereotypes about Jews from a young age. "We tell them to put aside everything they were told and we try to establish reality," she said. Suzanne Nakache (front) and Samia Essabaa at a ending candlelight ceremony at Auschwitz. Nakache is Jewish and Essabbaa is Muslim, and they hope their strong friendship serves as a model for others. 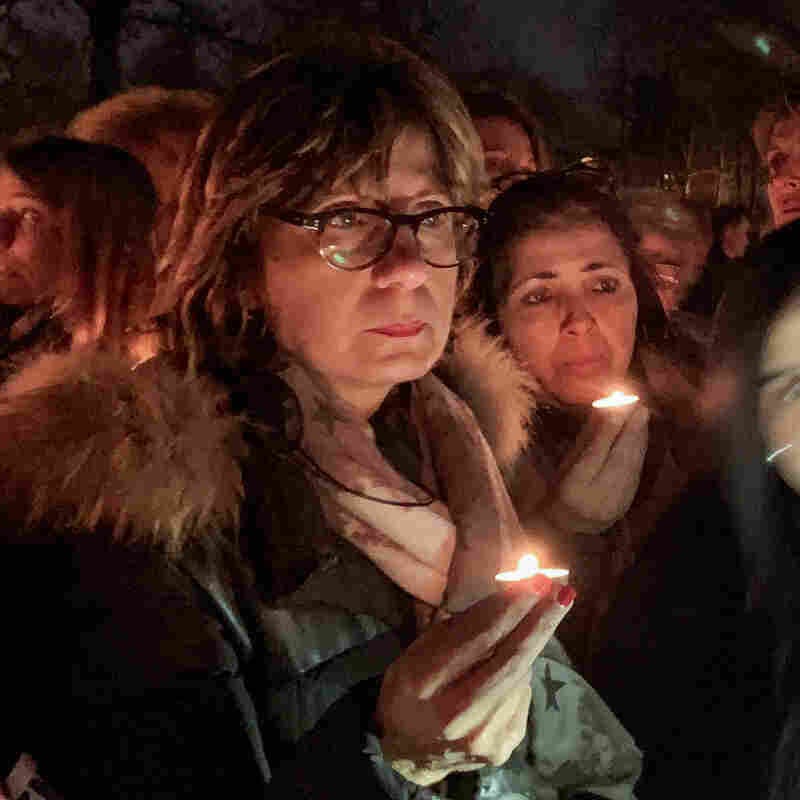 Langage de Femmes' vice president Suzanne Nakache, who is Jewish, said for French Jews it is important that the much larger Muslim population understands the trauma of the Holocaust. She believes the women on the trip now do and will share what they learned. "It was very hard for some of the black and Muslim women to think what happened to the Jews here, and I could see that," she said. There was stunned silence as the group walked through rooms showing tens of thousands of pairs of leather shoes and eye glasses. Nakache said during the tour one woman squeezed her hand, while another had tears streaming down her face. "They understand why you can't use insults like 'dirty Jew,' because it can end up here," she said. Nakache co-founded the group with Essabaa, and wishes everyone could have a relationship like theirs. "Samia is my best friend and she is a Muslim," she says. "We are very very close. I trust her, I love her. And she loves me, I'm sure."